The snowy egret (Egretta thula) is a small white heron. It is the American counterpart to the very similar Old World little egret, which has established a foothold in the Bahamas. At one time, the beautiful plumes of the snowy egret were in great demand by market hunters as decorations for women's hats. This reduced the population of the species to dangerously low levels. Now protected in the United States by law, under the Migratory Bird Treaty Act, this bird's population has rebounded.Adults are typically 61 cm (24 in) long and weigh 375 g (0.827 lb) They have a slim black bill and long black legs with yellow feet. The area of the upper bill, in front of the eyes, is yellow but turns red during the breeding season, when the adults also gain recurved plumes on the back, making for a "shaggy" effect. 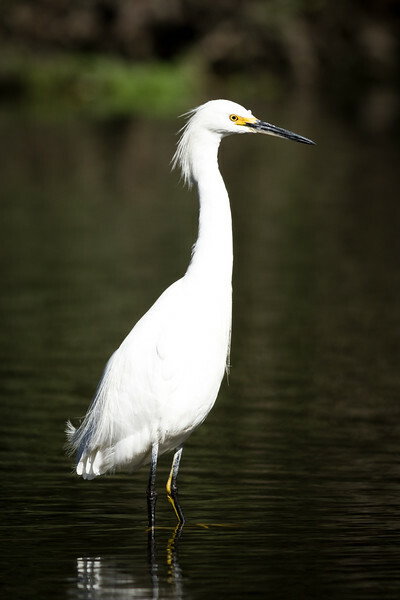 The juvenile looks similar to the adult, but the base of the bill is paler, and a green or yellow line runs down the back of the legs.The Snowy Egret eats mostly aquatic animals, including fish, frogs, worms, crustaceans, and insects. It often uses its bright yellow feet to paddle in the water or probe in the mud, rounding up prey before striking with its bill. Snowy Egrets feed while standing, walking, running, or hopping, and they may vibrate their bills, sway their heads, or flick their wings as part of prey gathering. They even forage while hovering. Snowy Egrets forage in saltmarsh pools, tidal channels, tidal flats, freshwater marshes, swamps, ocean inlets, and lake edges, usually preferring brackish or marine habitats with shallow water. Other foraging water birds often assemble around them to form mixed-species foraging groups.